Oh, winter! Snowstorms and illness! Our past week and a half has been consumed with sick children and doctor visits. Then, we had a snowstorm that dumped almost a foot of snow. Fortunately, I have stayed healthy and the kids are just about back to full strength. Unfortunately, with all the stress and "sleeping less" nights I decided to take a pass on Tedd Arnold's birthday celebration. Well, that was my thought until today. I had finally gotten the baby down for a nap that I was confident it was going to last more than 35 minutes, which meant we were not going to leave the house. The kids were playing well together until I started making dinner when my daughter stated she was "bored" and my son was literally bouncing off the walls. The volume in the kitchen was rising and frustration was building in sync with the boiling pot of water on the stove. I turned the burners off and asked my daughter to help me downstairs. She excitedly asked, "What are we going to do, Dad?" In my mind, I was going to have the kids make a Fly Guy doll based upon Tedd Arnold's Fly Guy Series (I saw they were available on Amazon , but I thought we could make one ourselves). This was something I was planning to do if I would have had the time and energy to pull off the birthday celebration. I responded,"We are going to make Fly Guy Dolls." (What was I thinking?...) In the basement we found some old black socks, pipe cleaners, two styrofoam balls, glue gun, a black marker, cotton balls, and batting (or as I would call it, stuffing). At this point, my wife probably thought I was nuts, and the baby had just woken up which was going to occupy her time. 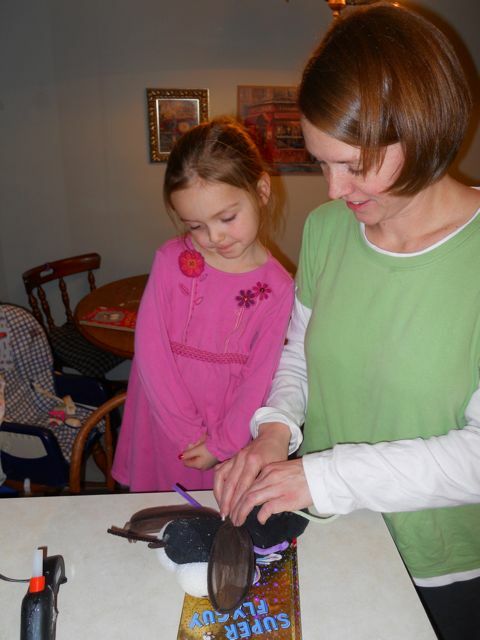 I needed to focus on dinner and this craft was all I had to guarantee my children were going to stay busy. I had them stuff the socks with batting. (I began reboiling the water for noodles.) Then, I tied off the sock, folded the bottom to the back and attached it with hot glue. 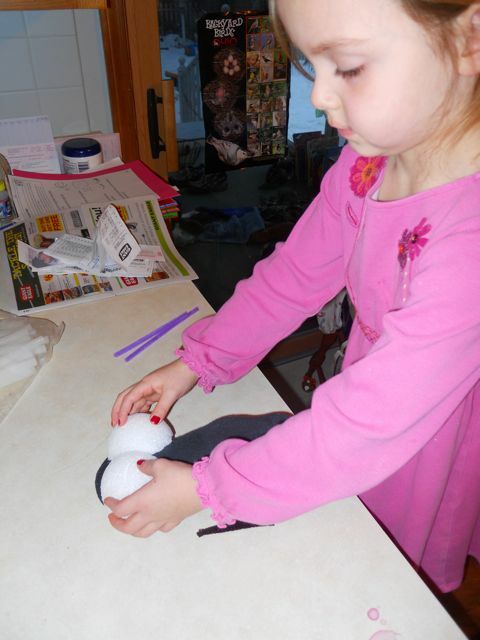 Then we cut the styrofoam balls in half and hot glued them on the stuffed sock. 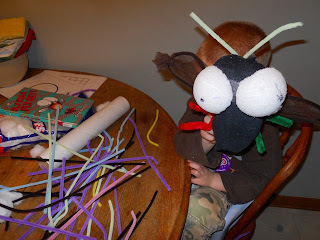 Their next job was to make a black dot for the eyes and pick out 6 pipe cleaners for antennae, arms, and legs. (I prepared the chicken teriyaki). Once the selections were made we poked holes in the sock and inserted the "parts". I added a little hot glue so our Fly Guys wouldn't "lend us a hand" or "break a leg". (dinner was just about ready and so were our Fly Guys.) To finish we needed wings and my wife was now able to lend a hand with them, which she ingeniously made out of pipe cleaners and pantyhose. (dinner is ready). Check out my FLY GUY! 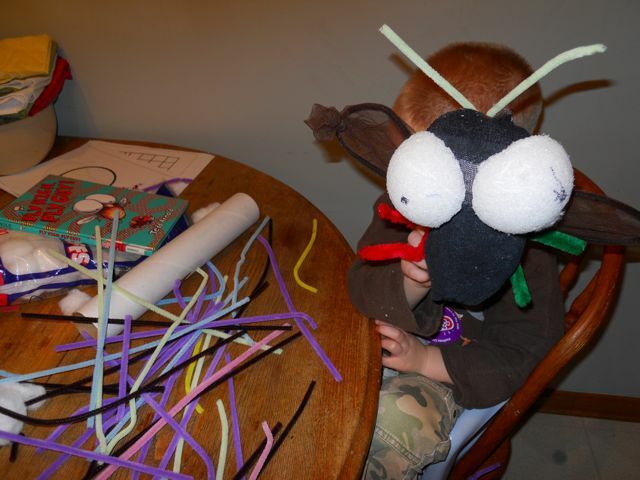 After dinner we added noses and a mouth! This was not my normal birthday celebration, but strangely it all worked out. I again find myself thankful for good books even in the midst of this crazy day. Happy Birthday Tedd Arnold! I love impromptu creativity! The Fly Guys look terrific! I love the concept of your blog! Thank you Gail and Katie! Wow, for not having a plan, those Fly Guys turned out great! 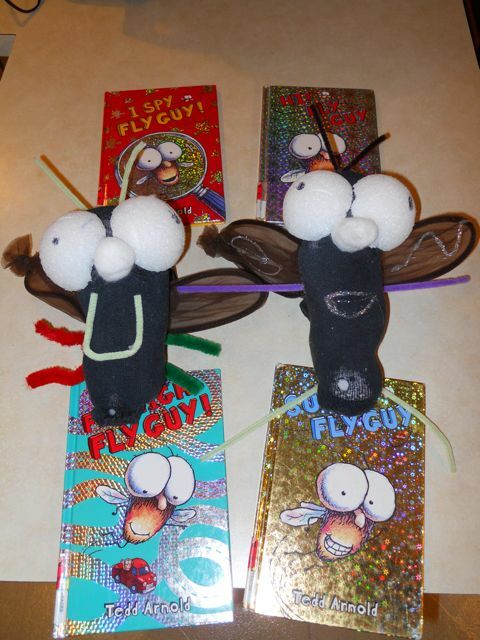 Fly Guy books are a hit here, too.